Dumeril's monitor (Varanus dumerilii) is a species of lizard, endemic to Southeast Asia. It is a member of the family Varanidae. The specific name, dumerilii, is in honour of French herpetologist André Marie Constant Duméril. In Thailand, V. dumerilii is known by the common name, túdtū̀ (ตุ๊ดตู่), which is an animal that appeared in children's folk songs. Dumeril's monitor is found in southern Burma and north of the Isthmus of Kra to Kanchanaburi Province in Thailand, as well as in Peninsular Malaysia, throughout Borneo, Sumatra, Riau, Bangka–Belitung and other smaller islands of Indonesia. The preferred habitat of V. dumerilii is dense evergreen forests with high humidity  and mangrove swamps. V. dumerilii is a crab specialist; however, it has been observed eating snails, insects, molluscs, fish, frogs, and smaller rodents. Little is known overall about this species compared to other monitor lizards. 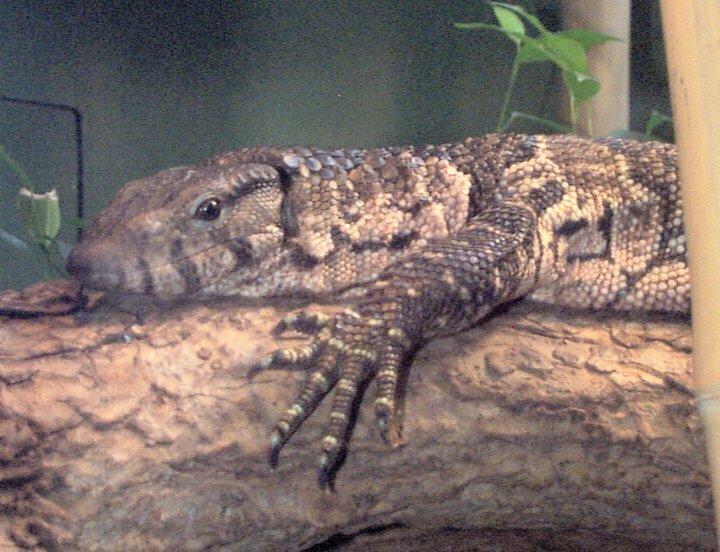 Adult Dumeril's monitors are largely dark coffee-brown in colour, with occasional brighter indistinct crossbars. For juveniles the colors and patterns are quite different. "The major color is a dark varnish black which is interrupted by several yellow crossways bars on the back." Juveniles have shiny orange red or, sometimes yellow heads. This youth coloration disappears after only 4–8 weeks. Adult Dumeril's can reach up to 4.5 ft (1.4 m) in total length (including tail) although typical length is 4 ft (1.2 m) long. Note: Sprackland made V. d. heteropholis a synonym of V. d. dumerilii. Wikimedia Commons has media related to Varanus dumerilii. ^ ""Varanus dumerilii ". ITIS.gov". ^ Beolens, Bo; Watkins, Michael; Grayson, Michael (2011). The Eponym Dictionary of Reptiles. Baltimore: Johns Hopkins University Press. xiii + 296 pp. ISBN 978-1-4214-0135-5. (Varanus dumerilii, p. 77). ^ "ตุ๊ดตู่" (in Thai). Sanook.com. Retrieved 16 June 2016. ^ a b Cota M, Chan-ard T, Mekchai S, Laoteaw S (2008). "Geographical Distribution, Instinctive Feeding Behavior and Report of Nocturnal Activity of Varanus dumerilii in Thailand". Biawak 2 (4): 152-158. ^ Lauprasert K, Thirakupt K (2001). "Species Diversity and Proposed Status of Monitor Lizards (Family Varanidae) in Southern Thailand". Natural History Journal of Chulalongkorn University 1 (1): 39-46. ^ a b "Lincoln Children's Zoo". ^ Krebs U (1979). "Der Dumeril-Waran (Varanus dumerilii), ein spezialisierter Krabbenfresser? ". Salamandra 15 (3): 146-157. (in German). ^ a b "Monitor-lizards.net". Archived from the original on 2010-05-19. ^ Sprackland RG (1993). "The taxonomic status of the monitor lizard Varanus dumerilii heteropholis BOULENGER 1892 (Reptilia: Varanidae)". Sarawak Museum Journal 44 (65): 113-121. Amer, Sayed A. M.; Kumazawa, Yoshinori (2008). "Timing of a mtDNA gene rearrangement and intercontinental dispersal of varanid lizards". Genes Genet. Syst. 83: 275–280. Auffenberg W (1988). Gray's monitor lizard. Gainesville: University of Florida. Ávalos, J. de; Martínez Carrión, P. (1997). "Warane ". Reptilia (Münster) 2 (5): 16-21. (in German). Barbour T (1921). "Aquatic skinks and arboreal monitors". Copeia 1921 (1): 42-44. Boulenger GA (1885). Catalogue of lizards in the British Museum (Natural History). Second Edition. Volume II ... Varanidæ ... London: Trustees of the British Museum (Natural History). (Taylor and Francis, printers). xiii + 497 pp. + Plates I-XXIV. (Varanus dumerilii, pp. 312–313). Brandenberg T (1983). Monitors in the Indo-Australian Archipelago. Leiden: E.J. Brill. 121 pp. Coborn, John (1987). Snakes and lizards: Their care and breeding in captivity. Newton Abbott: David and Charles Publishing. Cota M, Chan-ard T, Mekchai S, Laoteaw S (2008). "Geographical Distribution, Instinctive Feeding Behavior and Report of Nocturnal Activity of Varanus dumerilii in Thailand". Biawak 2 (4): 152-158. Cox, Merel J.; Van Dijk, Peter Paul; Nabhitabhata, Jarujin; Thirakhupt, Kumthorn (1998). A Photographic Guide to Snakes and other Reptiles of Peninsular Malaysia, Singapore and Thailand. Ralph Curtis Publishing. 144 pp. Davis R, Darling R, Darlington A (1986). "Ritualised combat in captive V. dumerilii ". Herpet. Rev. 17 (4): 85-86. Davis RB, Phillips LG (1991). "A method of sexing Dumeril's monitor Varanus dumerili ". Herp. Review 22 (1): 18-19. Harrison JL, Boo-Liat L (1957). "Monitors of Malaya". Malay. Nat. J. 12 (1): 1-10. Horn HG, Schulz B (1977). "Varanus dumerilii, wie ihn nicht jeder kennt ". Das Aquarium 11 (9): 37-38. (in German). Lekagul B (1969). "Monitors of Thailand". Conservation News of S.E. Asia 8: 31-32. Losos JB, Greene HW (1988). "Ecological and evolutionary implications of diet in monitor lizards". Biol. J. Linn. Soc. 35: 379-407. Mertens R (1942). "Die Familie der Waranae (Varanidae) ". Abh. Senck. Nat. Gesel. Abh. 462; 465; 466. (in German). Nutphand W (no date). The Monitors of Thailand. Bangkok: Mitphadung Publishing Office. Pitman CRS (1962). "More snake and lizard predators of birds". Bull. British Ornith. Club 82 (3): 45-55. Radford L, Payne FL (1989). "The reproduction and management of Varanus dumerilii ". International Zoo Yearbook 28: 153-155. Raven HC (1946). "Predators eating green turtle eggs in the East Indies". Copeia 1946 (1): 48.
de Rooij N (1915). The Reptiles of the Indo-Australian Archipelago. Leiden: E.J. Brill. Schlegel H (1839). Abbildungen neuer oder unvollständig bekannter AMPHIBIEN, nach der Natur oder dem Leben entworfen herausgegeben und mit einem erläuternden Texte begleitet. Düsseldorf: Arnz & Comp. xiv + 141 pp. (Monitor dumerilii, new species, p. 78). (in German). Smith MA (1922). "On a Collection of Reptiles and Batrachians from the mountains of Pahang, Malay Peninsula". Journal of the Federated Malay States 10: 263-282. (Varanus dumerilii, p. 269). Smith HC (1930). "The monitor lizards of Burma". Journal Bombay Nat. Hist. Soc. 34: 367-373. Taylor EH (1963). "Lizards of Thailand". Univ. Kansas Sci. Bull. 44 (14): 687-1077. (Varanus dumerilii, pp. 915, 918-920). Sprackland RG (1976). "Notes on Dumeril's monitor lizard Varanus dumerili (Schlegel)". Sarawak. Mus. J. 24 (45): 287-291.